"My family recently went on a vacation to Finland. In addition to enjoying the food and scenery, many of us fell in love with the lonkero, or long drink. This is a strictly Finnish drink made by combining cheap gin with citrus. The most common flavor is grapefruit, which is reproduced here. Lonkero is not sold in the US so I decided to try to copy it by referring to web sites from other tourists who tried to copy it and reading the ingredients on the company's web site." Place ice cubes in a cocktail glass. 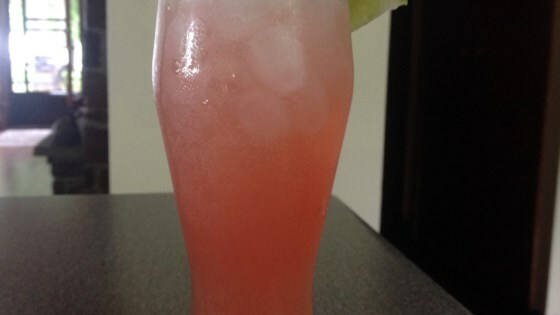 Pour gin over ice cubes; add grapefruit juice, lemon juice, and lime juice. Top with club soda and stir gently. Add more gin as desired. A shot of alcohol in the US. is usually between 2 tablespoons and 1/4 cup. You can play with the ingredient amounts but I find it tastes best when you use slightly more club soda than grapefruit juice. Substitute club soda for a lemon-lime soda (such as 7Up®, Sprite®, or Sierra Mist®), if desired. The key is to get the bubbles and the different citrus flavor. It's a bit sweeter with Sierra Mist®. Delicious! Just enough tartness with a touch more lemon juice for my palate. Nice drink! I played around with the proportions a little too much and made it a bit sour, but that's my own fault. Still quite good.